A lot of the time when I'm foraging, I am looking for something I can eat, but I also have my eyes peeled for things that I can use in my home. Occasionally I find something that does double duty! I posted on Instagram a while back this summer (and again in my summer recap post) about a local fruit stand that was forced to close down due to the highway expansion. This was a really cool place where you used to be able to get ice cream, fresh juice, local produce, coffee, and even swap a book for a new one in their lending library. The fruit stand shared the property with a mechanic's shop, and between the two an avenue of hops bines swayed in the wind. When we found out that the stand was closing I asked about the hops since we were interested in growing them. I found out that they were originally rhisomes taken from crowns from Crannóg Ales in Sorrento, BC, but that the owner of the stand had no idea which was which. We cut down some bines (yes, bines is the correct term - not vines) and dug up some of the crowns to try and plant them in our garden. 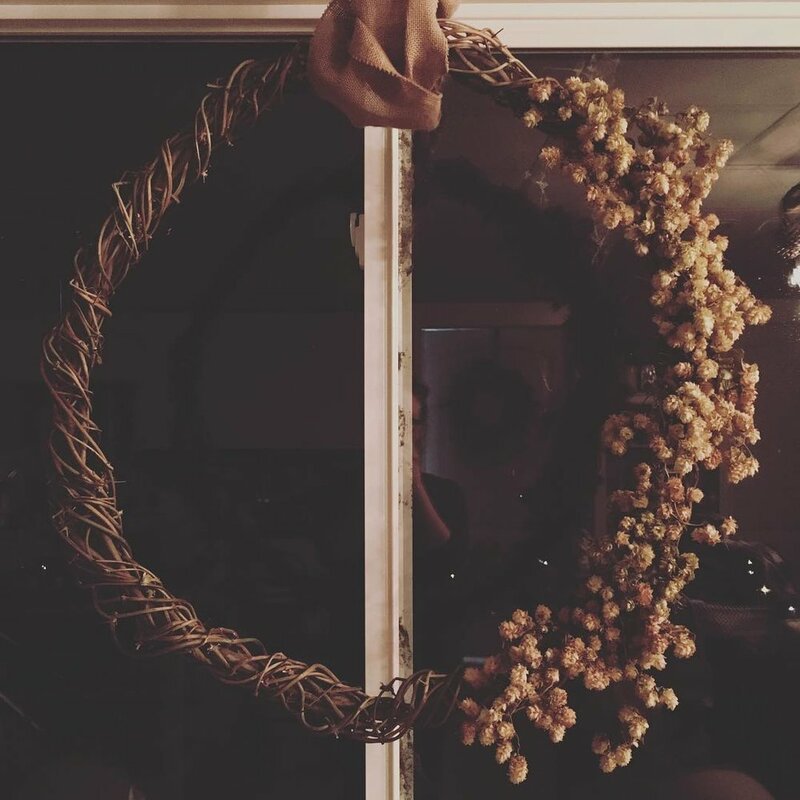 The hops currently on the bines were a bit past their prime, so we picked what we considered usable for brewing and dried those, and from the stripped bines I twisted together this wreath. Our house smelled so intensely of hops for about a week! I also tucked in some of the really dried out flowers (unusable for brewing) to decorate it. These aren't structural, so I'll decide whether I always want them to be there, but for now I think they are perfect. Take one of the longest bines and make a circle roughly the shape you want your finished wreath to be but a little smaller. Twist the rest of the bine around and around and around. Tuck the next bine in and keep twisting. Keep going until all your bines are a part of the wreath. Lay flat until the bines dry out completely. Hopefully you can see by the photos how I was twisting them. 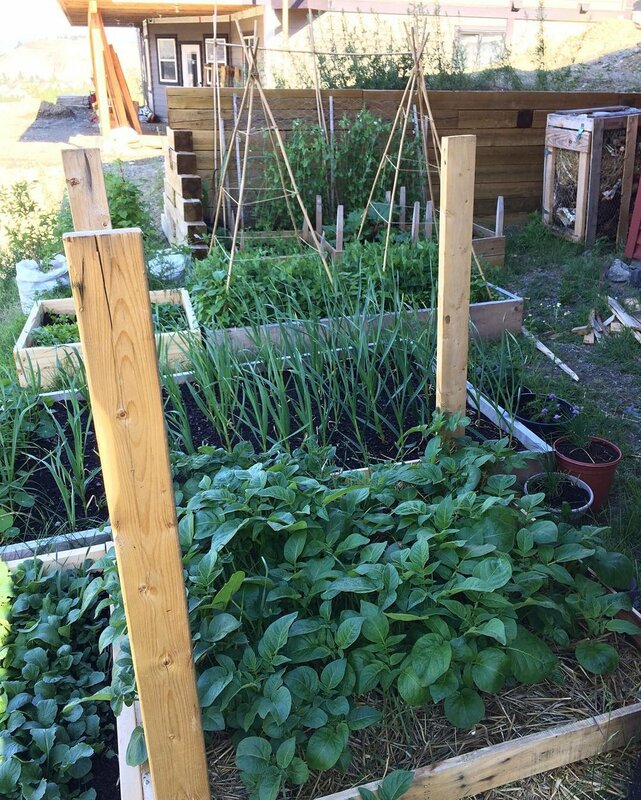 The good news is that you can make this using any kind of sturdy vine like grape, or Virginia creeper. Have fun experimenting and see what you come up with! I am really happy with the results of my wreath.